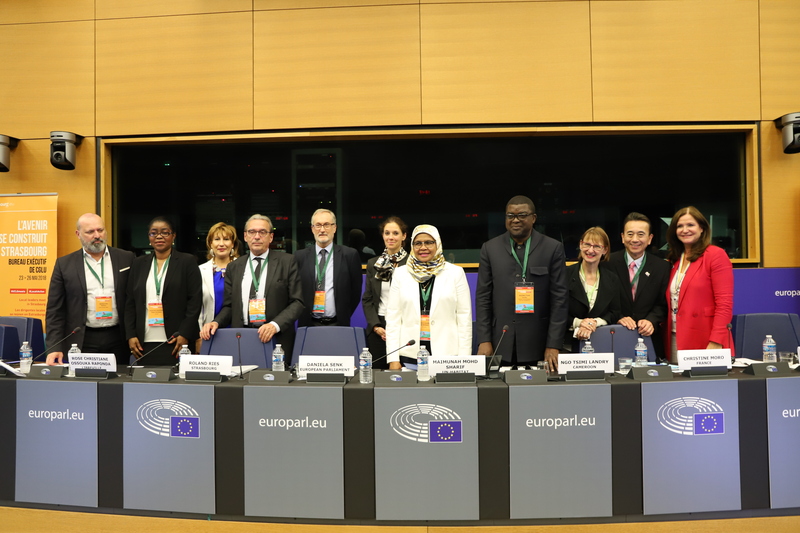 The UCLG Executive Bureau is took place from 23 to 26 May 2018 in Strasbourg in the headquarters of the European Parliament, under the kind invitation of Roland Ries, Mayor of the city . Under the theme “Inclusive and Safe Cities: Key for Sustainable Development” this 2018 Edition of the Executive Bureau constituted an unprecedented moment as for the first time is organized together with UN-Habitat and provided a space for dialogue between all levels of government. The 2018 edition of the Executive Bureau focused on the key priorities of local and regional governments for the global goals. 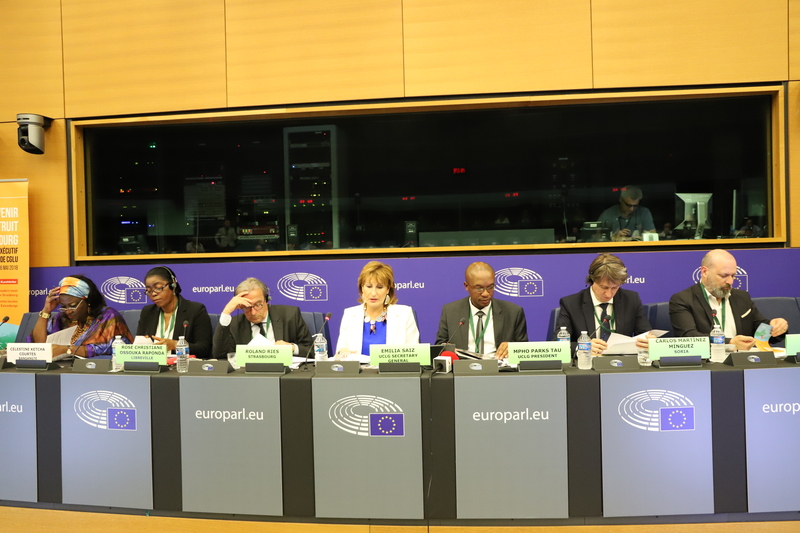 The debates in Strasbourg created an unique opportunity to share experiences at local and national level and to pave the way for a greater structural dialogue between different spheres of government, essential to achieve the implementation of Agenda 2030. The first day of the Executive Bureau was marked by preparatory working sessions. The UCLG Executive Bureau kicked off with a meeting of the UCLG Secretaries General to revise the work programme of the network as a whole and identify priorities and synergies for action. The day followed with a meeting of the Working Group on Territorial and Management of Crises where members defined the agenda for 2018. Firdaous Oussidhoum, Coordinator of the Forum introduced the upcoming 1st World Forum of Intermediary Cities to take place on 5-7 July in Chefchaouen, Morocco. For his part, Mohamed Sefiani, Mayor of Chefchaouen and President of the UCLG Forum on Intermediary Cities presented the objectives and programme of the Forum together with Nassénéba Touré, Mayor of Odienné. Roland Ries, Mayor of Strasbourg and Co-President of UCLG concluded the session of the Steering Committee of the Forum on Intermediary Cities. The Community of Practice on Transparency and Accountability also met under the presidency of Carlos Martínez, mayor of Soria and Vice-President of UCLG for Europe. The Community of Practice on Mobility met for the first time after the UCLG World Council in Hangzhou and was presided by Roland Ries, Mayor of Strasbourg and Yousef Shawarbeh, Mayor of Amman. Participants highlighted the role of urban transport in the sustainable development of cities and the reporting of SDG 11.2 in view of the High Level Political Forum (HLPF). A meeting of the Financial Management Committee and a working session of the Global Fund for Cities Development (FMDV) also took place on the same day. Tomorrow the second day of the Executive Bureau will be dedicated to the UCLG Policy Councils and the UCLG Strategy on Local Finance. Follow #Listen2Cities and #UCLGMeets for live updates! 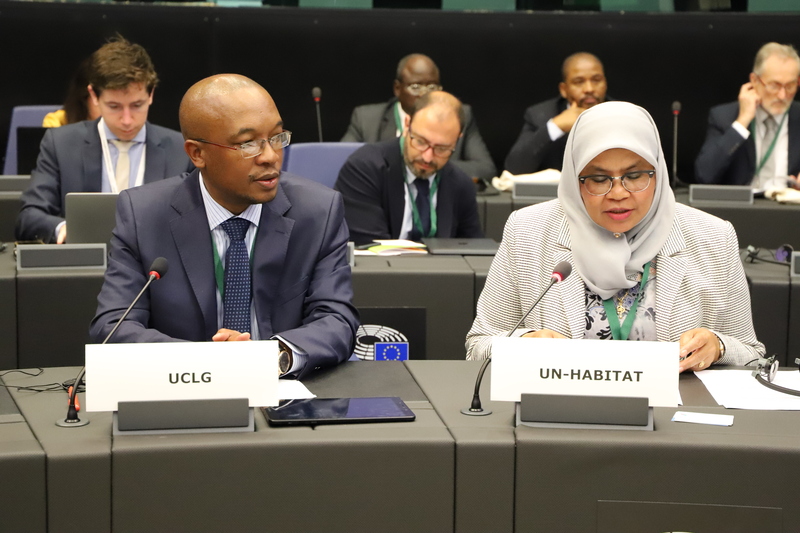 The day began with a meeting of national delegations on Country Implementation of SDG 11 organized by UN-Habitat inaugurated by Parks Tau, President of UCLG, and Maimunah Mohd Sharif, Executive Director of UN-Habitat. This meeting of national delegations was organised by UN-Habitat entitled “Make cities and human settlements inclusive, safe, resilient and sustainable”. Ministers presented their progress about the implementation of SDG 11 in their respective country. In parallel, followed a session on the UCLG Strategy on Local Finance organized with the Global Fund for Cities Development (FMDV) with the objectives to revised the UCLG Strategy on Local Finance and renewed partnerships with FMDV and the United Nations Capital Development Fund (UNCDF). The main focus of the day was the meeting of the Policy Council on the Right to the City and Inclusive Territories and the Policy Council on Opportunities for All. Both meetings hosted a High-Level Dialogue between Mayors and Ministers and the outcomes of this sessions will be shared during the Executive Bureau Business Session. The Policy Council on Right to the City addressed topics such a adequate housing, migration and gender equality and members shared their views on and policies on the Right to the City and its implementation. The session of the Policy Council on Opportunities for All revolved on how to protect the core values of culture, citizens’ participation and promote solidarity and peace as the bases for sustainable development. The Committee on Statutory Affairs and the European Caucus also hold a session during the day. The second day of the UCLG Executive Bureau concluded with the Opening of the Exhibition “Nés quelque part”. More #UCLGmeets tomorrow with the Executive Bureau Business Session and the High-Level Dialogue on the New Urban Agenda Implementation. Stay tuned and #Listen2Cities! The last day of our Executive Bureau saw the meetings of the Policy Councils on Multilevel Governance and Resilient Cities. As the previous day, the sessions hosted a High-Level Dialogue between Mayors and Ministers co organised with UN-HAbitat, the Global Taskforce and United Nations Advisory Committee of Local Authorities (UNACLA) and where participants discussed about different policies and their consequences at the different levels of government. The discussions of the Policy Council on Multilevel Governance focused on the territorial approach to development. Mayors and Ministers discussed how to build governance capabilities, implement effective partnerships and ensure accountable and transparent governance. The Policy Council on Resilience focused on opportunities and responses to emerging urban areas for inclusive, safe resilient and sustainable territories. This dialogue, organised in the framework of the Talanoa Dialogue, also approached environmental policies to improve sustainability and resilience in urban settlements as well as responsible consumption and production. Another highlight of the day was the High-Level Dialogue “Linking the Global Goals with the New Urban Agenda Implementation” organised in partnership with UNACLA and with the Global Taskforce. Maimunah Mohd Sharif, Executive Director of UN-Habitat, opened the session where participants provided inputs on the state of affairs of the implementation of the New Urban Agenda in their own territory, constituency or country. Emilia Saiz, Secretary General of UCLG highlighted the iconic moment for the organization for having coordinated the Executive Bureau together with UN-Habitat. This High-Level Dialogue will contribute to the High-Level Political Forum assessment of SDG 11. The day concluded with the Business Session of the Executive Bureau. Members of the Bureau analysed the progress made on the 2018 Work Plan and a UCLG Strategy on Localizing Finance for Sustainable Urbanization. The Intermediary Cities Agenda and the Local4Action Hub were topics discussed during the session. The winners of the 3rd Edition of the International Award UCLG-Mexico City-Culture 21 were announced to the members by the secretary of Culture of the City of Mexico and co-chair of the UCLG Committee of Culture. The co-winners are: the City of Seongbuck, Republic of Korea and the City of Lyon, France in the City category. The Jury also decided to give a special mention to the Cities of dublin Hamilton, Montevideo, Nablus, Novosibirsk and Saha-gu. The Award Ceremony will take place on 18-20 October 2018 in Mexico City. Next meetings of the World council will be held in Madrid in conjunction with the 2nd Word Forum on Urban Violence and Education for Coexistence and Peace! See you there! Read "Sustainable cities dialogue" publication.